Push the shutter button with your finger. Advantages: You never forget to take your trigger finger with you, and it doesn't cost anything. Cons: The action of pushing the button can shake or move the camera to impact the quality and sharpness of your picture. Use the camera's self-timer feature. (And you thought it was just for taking pictures of yourself.) Advantages: Again the feature is always there, and it came free with the camera. Cons: Takes some time to set up, and when you physically push the button to activate the self-timer the camera might move slightly. 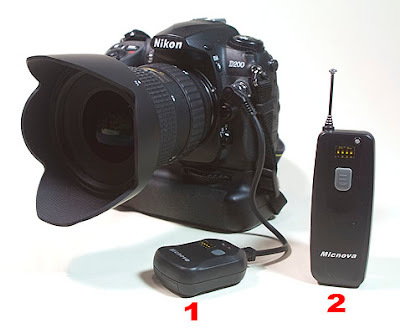 Use a wired or wireless shutter release. Advantages: Since the device is a switch that actuates your electronic shutter, it provides a truly motionless shutter button release and the sharpest alternative. Cons: The cost of purchasing the accessory. The cost was prohibitive enough that it wasn't until recently that I made the investment. (Up to this time I had been using the camera's self-timer exclusively.) The shutter release cables made by my camera manufacturer were expensive and were never on sale. Then I saw an ad on Pro Camera Gear's website for a wired and wireless remote made by a company called Micnova. The wired model was selling for $12.99 and the wireless remote version was priced at $29.95. That's over 60% less than I had thought I was going to spend. Being a wild and crazy guy (as well as never knowing when I might need the wireless feature to safely capture Sasquatch in the mountains of Washington), I purchased the wireless remote. 1) the receiver and 2) the transmitter. The wireless remote came with batteries and just needed to be attached to the front connector of my Nikon D200. Bingo. Ready to take pictures. The unit can be user set to any of 16 channels to avoid interference with the other Sports Illustrated photographers at the Super Bowl game. The button on the transmitter works just like the button on my camera's body. Push the button part way down to activate the meter and auto-focus, and then press the button the rest of the way down to trigger the shutter. So, here's a way of getting the advantages of a shutter release cable when taking tripod mounted pictures without spending too much money. Best of all, you don't have to worry about accidentally leaving a finger at home. In actual shooting conditions, I've been as far away as 30 feet from the camera, and the shutter has functioned without a hiccup. Both the wired and remote versions are available for most popular DSLRs. Hope this is helpful. If you have comments or questions, you know where to find me.